In keeping with the split personality of this site – it serves as both a blog and a repository for First Bull Run data (see the Pages section on the right) – I posted three official reports over the weekend. Since I usually don’t post on the weekends, I’ve decided to put up this type of data (these types of data?) on Saturdays and Sundays. I figure that way all the reports will be up this year, and I can start on the correspondence as well. Other pages I’ll be working on are regimental biographies and MOH winners in the battle. In related news, I received in the mail from a good friend a transcription of a letter written by Lt. Patrick Henry O’Rorke of his experiences during the battle. 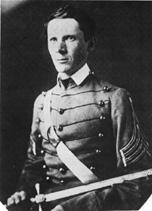 O’Rorke graduated first in the USMA class of June 1861, and served as an aide on BG Daniel Tyler’s staff that summer. He’s best known for his heroics and death on Little Round Top at Gettysburg on July 2, 1863 (you’ve probably rubbed his bronze nose there on occasion). It’s a great letter, but there’s a problem: I have no idea where the original is deposited. This makes the letter difficult to use. So, if any of you out there have any idea what letter I’m talking about, please drop me a line. In related-related news, I have tentatively determined that the role of the two USMA classes of 1861 in the battle will be the subject of my next round table program. Don’t get excited: I don’t have any takers yet. If you’re interested, leave a note on the Speaking Dates page. Categories : Articles, Soldiers, Speaking, The Project, What is this?